A few posts back I mentioned that I received in the mail, James Barker‘s revised dissertation, John’s Use of Matthew. I couldn’t wait to dig in and it has been a rewarding read so far. In fact, this is one of the most engagingly written academic books I have read in some time. Perhaps this judgement is due to my own interest in the subject, but much of it is also due to Barker’s careful argument and concise writing. Today I only want to consider the first two chapters, mainly because blogging through the book in sections rather than all at once holds me accountable to be precise in representing and evaluating Barker’s argument. Such arguments are intricate and deserve careful scrutiny. Before I begin discussing the book I should also self-disclose. When I first began my graduate studies in the gospels, I held the opinion that John was independent of the Synoptics. While in my doctoral program, I became persuaded (largely through arguments offered in commentaries by C.K. Barrett, Joel Marcus, and others) that John was, at the very least, familiar with Mark and possibly Luke. Of course, Matthew usually gets short shrift in that scenario and this is something Barker takes head on. 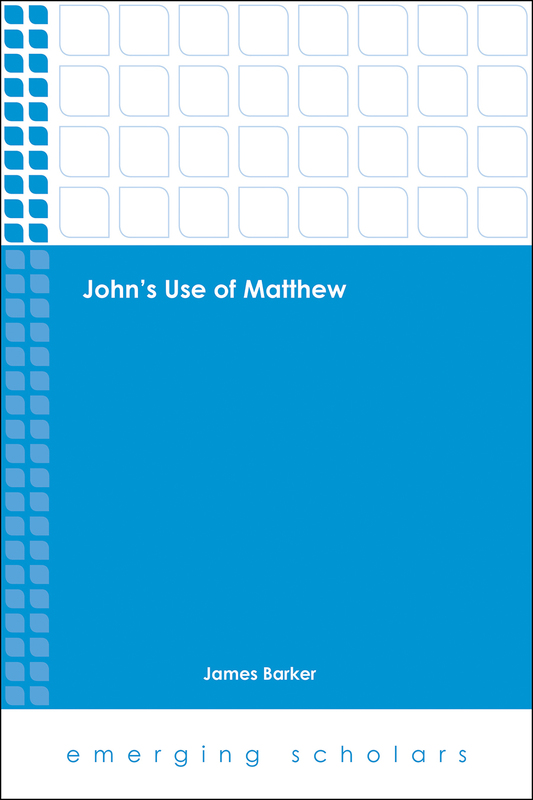 He aims to demonstrate that John both knew and made use of Matthew’s written gospel. After a brief introduction in which he lays out the argument of each chapter (xv-xix), Barker’s first chapter (pp. 1-14) provides an abbreviated though representative Forschungsbericht on the question of John’s knowledge of Matthew, beginning with the first seventeen hundred years of interpretation and ending with the various shifts that have occurred in the past two hundred years. It is worth noting that the shifts in scholarly opinion in the last two centuries alone include the “consensus” that John knew Mark and Luke but not Matthew, followed by the “consensus” of Johannine independence, followed by the present state in which various opinions hold sway among scholars. Barker’s book bounds into this present state of uncertainty with careful and judicious argumentation that begs to be taken seriously. The lack of a present consensus provides Barker with an opportunity to have his argument heard. In chapter 2, Barker sets forth his redaction-critical methodology, which relies heavily upon Helmut Koester’s principle that when an interpreter observes words or phrases deriving from the author or redactor of a gospel writing, that interpreter must assume the existence of a written source. In other words, if elements of Matthean redaction can be located in John-Synoptic parallels, there is a strong likelihood that those parallels derive from a written form of Matthew’s gospel. Against this backdrop he examines three previously adduced John-Matthew parallels: John 12:25/Matt 10:39; John 4:46b-54/Matt 8:5-13; John 20:11-18/Matt 28:9-10. He notes that the first of these does not meet Koester’s redaction criterion, while the other two do. Throughout this chapter, Barker is particularly adept at both anticipating objections to his argument and clarifying the nuances of his own approach. Of particular importance to his argument is his insistence that while John used Matthew’s Gospel, he did not intend to supplant Matthew (a common argument given the vast differences between the two narratives). Instead he argues that a practice known as oppositio in imitando should inform our understanding of John’s use of Matthew; to demonstrate this approach, he discusses how later infancy gospels used and built upon the legacies of (what eventually became) canonical birth narratives while arguing that supplanting those gospels would have been an unrealistic goal. One can read, for instance, the Protoevangelium of James and recognize the author’s instructive and corrective instincts vis-a-vis the infancy narratives in Matthew and Luke. It is unlikely, however, that the Protoevangelium of James was meant to supplant or replace either Matthew or Luke. Instead, it was meant to stand alongside and complement the others. This is illustrative of how Barker views John’s intentions toward Matthew.